What Makes the Best Mag Fed Paintball Guns? Paintball has become more than just a past time for people who love action and excitement. It has quickly evolved into a highly sought after sport, bonding activity, company outing game and even an impressively solid first date with the girl of your dreams. And it doesn’t matter whether you are an amateur or a professional and experienced paintball enthusiast, all of you deserve to find and use the best mag fed paintball guns. There are several type of paintball guns out there in the market and out of these types or models, there are 3 basic categories that you can actually choose from. The pump paintball gun is considered to be the oldest type of gun used by gamers. they are known for their accuracy and player focus when they are out there in the field. They need to be operated manually which makes it more challenging for a new player to get used to. Mechanical paintball guns are the most common and probably the most user friendly out of all paintball guns that you will find. They are usually semi-automatic and are easier to use – target-wise and fire power. Mag fed paintballs belong in this category. Electronic paintball guns are battery operated and are more expensive compared to the others. They have increased firepower and offer different firing mode options that players can select while in the battlefield. 5 Related Video: THE MOST EFFICIENT MAGFED PAINTBALL MARKER EVER? Tippman Tactical Compact Paintball 3Skull – Worried about not having enough ammo for a long paintball battle with your friends? Well, you really do not have to really be concerned about it because this paintball gun can conveniently switch from a Tru-Feed 7 –ball magazine to a 12-ball magazine and can even house a 20-round Zetamag with no complications or problems at all. Aside from this, you can easily switch from one magazine system to another. So if you want to start with a standard hopper and finish with the classic high-powered mag-fed method, you may do so with ease. Tippman TCR Magfed Tactical Paintball – this model comes with 2 magazines: a 7-ball magazine and a 12-ball magazine that you can use interchangeably whenever you want to. This is also a versatile type of paintball gun because you can go for the old-school hopper fed gun and switch to a mag-fed ammunition without any trouble at all. 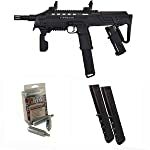 Tippman TMC Magfed Paintball Marker – just like the other 2 models, Tippman’s TMC Magfed Paintball Marker allows its players to feed their guns via a standard hopper or a magazine, depending on the amount of paintballs or ammos they intend to fire. It comes with 2 20-round spring-driven mags. Tippman TMC Magfed Paintball Marker – With a fully functional charging handle, you can be sure you won’t have any problems handling this paintball gun at all. The grip is rubber coated for added traction. The stock is collapsible in 5 different positions and at the same time the external selector can also be adjusted in 2 ways. The Tippman TMC looks and feels real! Its shroud sports an AR-15 style that comes with a built-in feature of 4-sided picatinny rails. Worried about not being to fire the paintballs on time, well, this model has an easy to pull trigger to ensure that you won’t miss any opportunity to take that shot and win the game. Tippman Tactical Compact Paintball 3Skull – the Tippman 3Skull is definitely designed to ensure players that ease of shooting with utmost precision. The compact design is great for both newbies and seasoned players. This paintball gun has several main features including the above mentioned magazine system and hopper conversions. Aside from that, it really has a solid design. The design alone is military grade, so realistic that it will pass for a real live ammo powered semi-automatic. The vertical front grip is foldable, which makes it easier to store and carry around. Not to mention the fact that it is easier for you to drop down on the ground and start firing at your opponents without restraints. 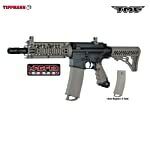 Tippman TCR Magfed Tactical Paintball – Tippman is known for having realistic looking paintball guns, so this means that this model doesn’t fall far from the tree. The collapsible stock is an added feature that ensures versatility and flexibility. This means that you can collapse the stock and slide in an additional magazine – to make sure that you have enough paint to push through the game. With its foldable vertical handle, you can easily drop on the ground or fire back at opponents in a running position, without complaining about jams, backlashes and sore arms and shoulders again. Tippman TCR Magfed Tactical Paintball – comes with C02 cartridges or powerlets that give you enough firepower to last you an entire game. It is also first strike round and remote line adapter. The barrel is around 11 inches with a flip top sights for accuracy and marking your targets. Tippman TMC Magfed Paintball Marker – with a 12-inch high-performance barrel, the Tippman TMC Magfed Marker is definitely a beauty that packs enough fire power to beat all your competitors. It also has a muzzle break to add more force and friction to the paintball when fired. It has a high-powered in-line bolt system, as well full, pneumatic tactical carbine marker. To make sure that you will always hit your target with precision, the front and rear sights are completely adjustable to suit your needs. Tippman Tactical Compact Paintball 3Skull – the 3Skull is equipped with an 11-inch high performance barrel. With 2 air sources, you can be sure that your shots will not lack that speed and strength to hit your target. And while we are in the subject of targets, it’s front and rear adjustable sights or markers will make sure that every shot you fire will not go to waste. Now, taking a look at the 3 qualities that we need to consider when buying the best of the best mag fed paintball guns, the Tippman TMC Magfed Paintball Marker is clearly our top pick for the job. With its realistic look and feel, anyone would easily feel that they are in the middle of a battle zone fighting for their lives. The Tippman TMC is versatile and can easily be customized to meet your paint ball gaming needs. It is strategically designed and is user-friendly – perfect for both newbies and seasoned paintball gamers. Now, if you feel that a larger paintball gun is not for you, the Tippman Tactical Compact Paintball 3Skull can be your second choice. Not only is it also easy to use and master, it is also compact and lighter. Related Video: THE MOST EFFICIENT MAGFED PAINTBALL MARKER EVER?